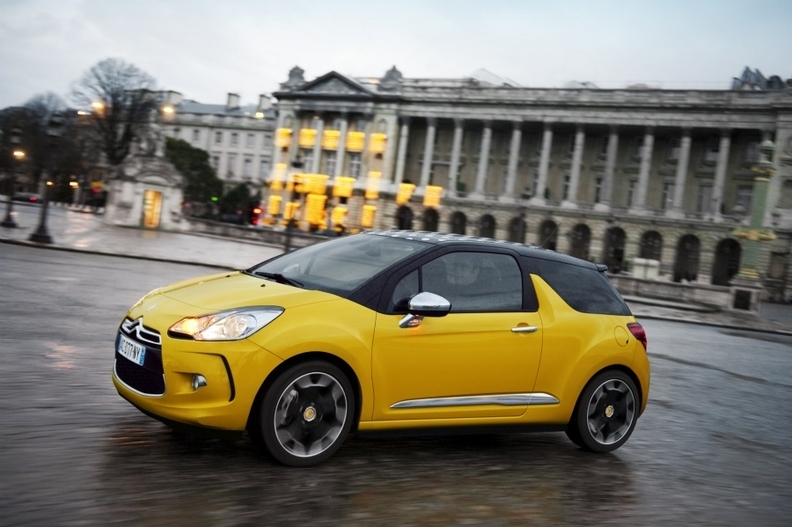 The Citroen DS3 may get new body variations such as a softtop version and special editions. Citroen says its new DS3 sporty subcompact car is selling better than expected and is winning new customers for the French brand. Frederic Banzet, Citroen managing director, said DS3 sales account for about a quarter of the volume for the C3 range. "This is twice as much as what we aimed for. The DS line is a huge success," he said. Since its launch 12 months ago, the DS3, which is a sporty version of the C3 hatchback, has sold 80,000 units, compared with 300,000 for the whole C3 range, Banzet told Automotive News Europe. He said the DS3 has a very high conquest rate and 56 percent of its buyers were new customers to the brand. The DS line is also bringing wealthy buyers to the brand. As an example, Banzet cited the sale of a DS3 to a French couple where the husband drives a Maserati Quattroporte and his wife a Porsche. "They planned to buy a Mini, but they first tried out the DS3 and bought it instead. We would have never had appealed to these customers without the DS brand," he said. The DS3 is the first model in Citroen's DS "distinctive series" upscale line. Citroen plans to launch the DS4, based on the C4 compact in May, followed by the DS5, based on the C5, early next year. Banzet said the DS line "is aimed at less conventional drivers who want more emotion, more power, better quality. The DS4 and DS5 will further increase that trend," he said. The DS3 will probably have new body variations such as a softtop version and special editions launched in cooperation with high-profile fashion brands to further increase the line's appeal, Banzet said. He denied rumors that Citroen is considering launching a DS sports car that would have styling cues from the Survolt concept, which debuted at the 2010 Geneva auto show. "The DS line already has a performance car, the DS3 Racing," he said. Citroen also may also launch a flagship DS, called the DS9, to compete with German luxury brands. The car would be a production version of the Metropolis concept unveiled at the 2010 Shanghai World Expo.